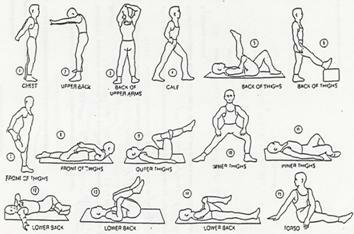 It is important to warm your muscles up before stretching to prevent injury! The general warm up consists of a light jog or run just to warm your muscles up and to get your heart pumping. The sport-specific activity is some easy parkour, me and my friends often do a vaults game where you have to perform the same vault as the person who began, the point of this is to get your body used to the demand of parkour. Warming up can do more than just loosen stiff muscles, it actually improve your performance. This is a clear plan of a warm up routine this should be done everyday before you start any parkour. Warming up This is literally the process of warming up. A proper warm-up should raise your body temperature by a couple degrees. Go on a jog up and down by your previously chosen wall. Assign movements to specific numbers, for example when some one says 'one' you have to roll or touch your right hand on the ground. Do this for about 5 mins. Do not get completely tired out it should be easy to talk whilst doing this. Stretching This consists of two types of stretching and you should use both. After your jog do the following.. Sport Specific this is the activity which gets you ready for actual parkour. Do a vaults game. The idea is that you have to perform the same vault as the person who began, the person who starts switches each time. You can progressively make the vaults harder, to create a smooth transition into the hard physical demand of parkour.